Go Moment is an example of an intelligent assistant that provides many benefits, while at the same time disrupting longstanding patterns of customer service. I recently saw a webinar by Tom Austin of Gartner on the topic of Smart Machine Big Bang Disruption. During the presentation, Austin mentioned the company Go Moment as an example of an intelligent assistant that provides many benefits, while at the same time disrupting longstanding patterns of customer service. 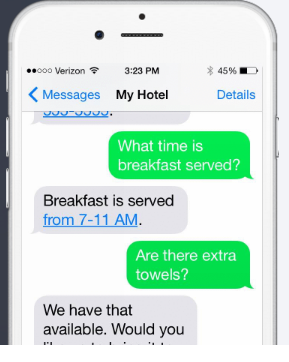 Hotels use Go Moment’s Ivy to provide guests with a virtual assistant concierge. Guests interact with Ivy using text messages. I recently noted how much buzz there is around chat-based customer service interactions. An SMS-based smart hotel concierge is yet another indication of the growing significance of chat in the customer service realm. In his webinar, Austin notes that the rise of smart machines offers both opportunities and risks. Companies stand to save money by automating tasks traditionally performed by humans. At the same time, they need to help workers acquire skills that enable them to leverage smart machines to excel. Go Moment’s Ivy can answer many of a hotel guest’s common questions, lessening their need to call the front desk or guest services. An article in Hotel Online takes the stance that Go Moment’s technology frees up human hotel personnel to assist guests with more complex questions and transactions that require the human touch. According to the same Hotel Online article, Go Moment leverages IBM’s Watson platform to power the app’s natural language processing and question and answering system. Ivy can also query guests about how they’d rate their stay. If they view their stay positively, Ivy can prompt them to write an online review. If the guest isn’t completely happy, Ivy alerts a human staffer who can seek to make things right before the guest posts a potentially damaging review. Intelligent machines are likely to automate an increasing percentage of the transactions that were once human-to-human. The first challenge is to make those interactions truly beneficial to the customer on the other side of the conversation. The second is to ensure the human who used to be across from the customer can now add even more value to the service equation.